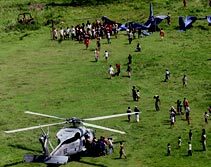 And several SH-60 helicopters have been arriving to help move aid and injured survivors. The helicopters are carrying drinking water, food, and other necessities to communities in need. Helicopter pilots and crews are working with great diligence to get aid to those who have not received any yet. Helicopter aid operations are continuing in full force.